Although TechEd 2007 was ho hum in terms of new annoucements, it was an excellent conference showcasing the benefits of how well the new suites of 2007 products integrate with each other. The conference was kicked off by Bob Muglia keynote and demos. If you missed it, it is worth a view (link). From the Windows Mobile 6 tight integration with with Exchange 2007 to Office 2007 and Sharepoint 2007, all of the products were well showcased. As it did with when .NET was first released, Microsoft is now spending the time to educate developers on how they can use the products they recently released, before bombarding everyone with futures. This strategy clearly helps them sell products, and in the end they are a product company. In the Architecture track there was a good bit of discussion of the Agile development process and how that fits in to the Visual Studio product set. It is interesting to note that Microsoft still does not have a product suite that supports the development process from conception to implementation. They do have the key pieces like Visual Studio Team Services, but there are many holes. There is no tool which captures requirements and maps them to Use cases. The response is that most analysts use Word and Visio. Unfortunately this is true, however the reason is not that Word and Vision work well, it is that a set of easy to use tools which integrate well with Visual Studio don't exist. A useful integration of tasks entries between Visual Studio, Project, Sharepoint, and Outlook still does not exist. The party line of not wanting to push a specific development methodology is becoming thin, customers want and need best practices. Yes you should have choice, but it does not have to be everything to everybody. Speaking of methodology, I did come away impressed by the discussions on the Agile development process, it has clearly matured into something that is worth taking a second look at. The core concept of paired programming is still what makes Agile agile, but there seems to be more consensus that design before coding is key to its success. In my opinion this is paramount, since I don't believe in jumping into to code before you have a decent grasp on a design is wise. As I mentioned before I did put the Wing through its paces, and as with every Windows Mobile device I have owned memory is a big issue although memory management in WM 6 works much better. The general consensus from the WM 6 team at the conference was that they did not understand why vendors were not putting more memory in their devices. I could not agree more, if I had 64MB more of RAM, the Wing would almost be perfect. My next rants would then be processor speed and 3G. It looks like Palm is listening. According to Gizmodo, Palm will release the Treo 800W in the fourth quarter. It will support EV-DO REV A., WM 6, Pro a 320x320 display, 256MB flash, 128MB RAM, a 1.3-megapixel camera, Wi-Fi, GPS, Bluetooth, and an expansion slot. The camera seems to be its only downfall and hopefully Palm will have learned that a soft reset switch is important. Pulling the battery out is just not cool. I have to say that I am not a big fan of CDMA, not because of the technology, but because it is just not usable when you are traveling abroad. That said I am impressed with EV-DO Revision A every time I use it. If you travel or are of the office six or more days a month, you should consider it. I based this on a $60 a month data plan versus paying $10 a day at hotels like Marriott and Sheraton. And you get the advantage of accessing the network on the road and at airports. The new Orange county convention center is quite large built like an "H", the North and South sides contain the meeting rooms. The two sides are connected via a huge expo center. Finding the quickest way to get from point a to point b is a challenge. The Windows Mobile team along with a research project at Graz University of Technology came up with a solution, an application called Signpost. This application runs on the Windows Mobile platform with any camera enabled device. The application has a map of the facility along with the schedule and location of sessions. There is an update function which will refresh the schedule in real time. 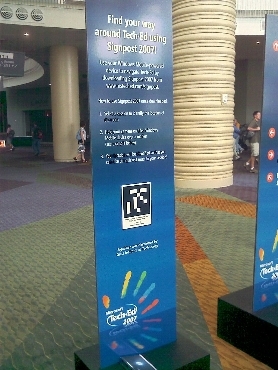 They have located signposts around the convention like the one below, you point the camera to it, the application recognizes the symbol and shows you your location in reference to where you want to go. This picture was taken with the T-Mobile Wing (linked to original), I am finding that the image quality from the camera is very good, however memory constraints have forced me into too many reboots. I am now working on organizing my applications to see which one fails to unload its dll (more on that later). By now everyone should have seen this in the press at large, I forgot to post it when I got to Orlando but I think it would be good to post anyway. Sunday night as I was flipping through channels, I did a double take when a commercial (link) flashed by, for Apple's iPhone from AT&T. 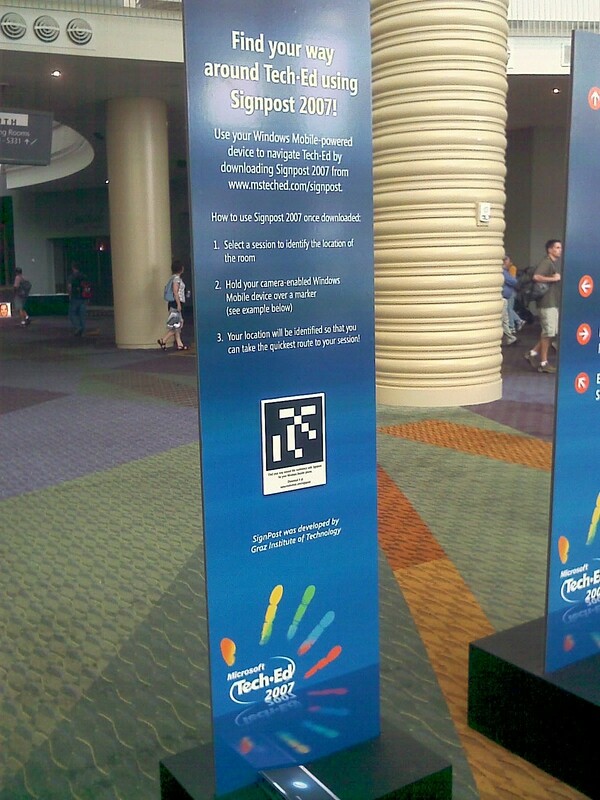 The ad focuses on using your finger tip to operate the device.and announces the official released date of 6/29/07. This seems to have taken the press by surprise (classic Apple). The iPhone is becoming such big news that even the Wall Street Journal reported the commercial airing this morning. If this device works as advertised I think they will hit their 10 million target by the end of 2008. Another interesting note, is that AT&T is a one of the sponsors/vendors here at TechEd 2007. They seem to be pushing Windows Mobile hard in the business community. Microsoft's goal is clearly going after RIM and establishing themselves as the mobile solution of choice. I was told by an AT&T representative that the Samsung BlackJack was selling off the shelves to corporations, and how surprised they were since they had targeted the phone for consumers.